This entry was posted in Hazardous materials on 2018/05/23 by Susan. Diesel exhaust is a known carcinogen. Employers must assess the risk it poses to workers, even though there isn’t yet an occupational exposure limit for it. 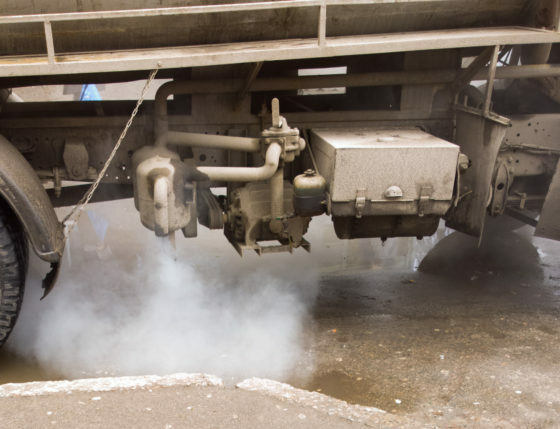 Workers in many industries are exposed to diesel exhaust. Long-term exposure can have serious health effects, including cancer. People most at risk are those who work with diesel-powered vehicles and machines like forklifts, trains, farm vehicles, and construction equipment. Recently I learned more about the complexities of diesel exhaust from Geoff Clark, senior occupational hygienist at WorkSafeBC. Geoff was speaking to a group of employers, supervisors, and other safety advocates at an occupational disease symposium in Vancouver. He said diesel exhaust can have up to 100 times more particulates in it than exhaust from a gas engine. “These particulates can get deep into your lungs,” Geoff told the group at the event hosted by the BC Construction Safety Alliance and WorkSafeBC. He said the International Agency for Research on Cancer (IARC) classified it as a Group 1 carcinogen in 2012. Their studies show that people exposed to diesel exhaust have an increased risk of developing lung cancer and possibly bladder cancer. Geoff also told us about the challenges of sampling and measuring diesel exhaust. He explained that the make-up of diesel exhaust varies, depending on many factors: type of engine, fuel formulation, operating conditions, and workload are but a few. This makes it challenging to figure out which chemicals in diesel exhaust to sample and measure. For this reason, there is not yet an occupational exposure limit (OEL) for diesel exhaust per se. “However, all provinces have exposure limits for various components of diesel exhaust, such as carbon monoxide, nitrogen dioxide, and sulfur dioxide,” said Geoff in an email to me after his talk. He added that the only province with an exposure limit for elemental carbon (one of the most likely indicators of diesel exhaust) is Ontario, specifically in mines. Even though there isn’t an OEL for diesel exhaust yet, employers are still responsible for assessing the risk it poses to their workers. According to section 5.2 of the Occupational Health and Safety Regulation, employers must inform workers about hazardous substances in their workplaces and develop safe work procedures. Employers have a number of ways to minimize workers’ exposure. Proper machine maintenance, modifying workplace layout, and using alternative fuel sources are among the solutions. For much more information, see Diesel Exhaust from the Canadian Centre for Occupational Health and Safety. And an OEL for diesel exhaust is under consideration: WorkSafeBC’s Risk Analysis Unit is working with a number of agencies to review the next steps. Stay tuned for more information as things progress – and, as always, I’d like to know what you think.